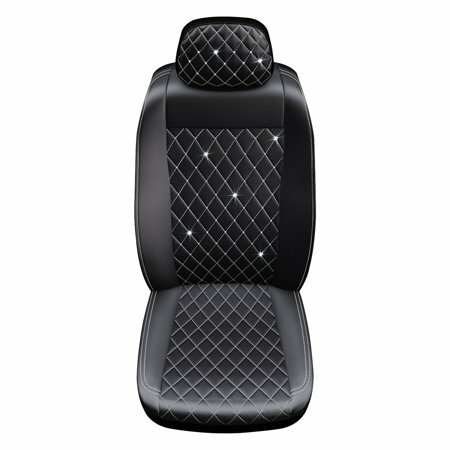 Personalize your ride with this Swarovski Black Seat Cover. It's made of a high-quality material and is easy to attach without the need for additional tools. This Swarovski seat cover comes with an elegant diamond pattern in contrast with white stitching embellished with Swarovski crystals. It's ideal for use on low-back seats with adjustable headrests or high-back bucket seats without headrests. It offers long-lasting protection from staining, pet hair and body oil, while also enhancing the look of your vehicle's interior. Fits on low-back seats with adjustable headrests or high-back bucket seats without headrests. I am reviewing the Swarovski Diamond Seat Cover in black. I feel this is a good quality cover with faux leather and has Swarovski crystals attached to the back rest part of this cover. I feel they are attached well and will not be falling off any time soon. They really glisten and shimmer in the sun light and give any car seat a more luxurious look and feel. The seat cover is a two piece set and was very easy to put on. It is only for seats with a head rest or a very high back. It is not for front car seats that don't have a head rest or bucket seats. This item is one seat cover and not a pair of them. I like that the crystals are attached to the back rest part of the seat cover and not the part you sit on as I feel your rear end dragging against them would increase the chances of the crystals coming off pretty quickly. The packaging is nice and I feel that this would make a great gift for something. I feel its not one of those items that people really feel like buying for themselves but its a great gift idea to help someone spruce up their car's interior. Recommended. The day I got my Swarovski Diamond Seat Cover in black I installed it in my 2001 Dodge Durango. It took me less than 10 minutes to put it on. The installation Instructions are excellent, unlike most items you buy today. No tools are required to install them and it is a one person job. My Durango seat has been needing a new cover for a few years. I have been apprehensive in getting a "one size fits all"cover. Years ago I bought some for another car I had and they did not fit well, slipped off, and bunched up when you sat on them. I have had my Swarovski Diamond seat covers on for two weeks and they are perfect. The temperature here in Minnesota this morning was -20 degrees. My seat covers were not brittle and fit like a glove. The color black with the Swarovski crystals are very attractive and give my old Durango a new look. I have a highback bucket seat without a headrest These covers fit perfect.For those vehicles that have back seat air bags these covers are designed to work with them and will not hamper their operation. I am so pleased with my Swarovski Diamond seat cover I will be buying one for the passenger side of my Durango and a set for my wife's car as well. I highly recommend these to anyone who wants their seats to look like new. I'm sure you will be as happy as I . The Swarovski Diamond Seat Cover not only look beautiful,also is easy to instal on any seat, low back or high back. It's fits perfect, not loose if you properly hooked under the seats using the provided hooks. The material is high quality and the crystal doesn't bored when you seat on it . I loved so much and it look so beautiful on my car that I will buy another set . I really recommend. The Swarovski Black Seat Cover fit like a glove the driver's seat of my ford expedition. Seat cover of high-quality material, sturdy, elegant and easy to attach without the need for additional tools. It looks like a high end seat cover, with an elegant diamond pattern in contrast with white stitching embellished with crystals. Although it is designed for use on low-back seats with adjustable headrests or high-back bucket seats without headrests, if fit easily the seat of my truck. It is sturdy enough to be protected from stains, pet hair and body oil. Definitely recommend it to those who want to protect their vehicle's seat while beautify the interior. Swarovski Diamonds are my best friend, too! The Swarovski Diamond Seat Cover comes in a package of one. I did not know that you could actually buy one seat cover. I have only dealt with seat covers that come in pairs. This particular seat cover is gorgeous. I do like a little bling in my life and this certainly sparkled up my car's interior! I have an older car so a new seat cover was something that I needed. My car's interior is white but this black seat cover sparkles like a new penny! You cannot feel the crystals on your back when you sit on the seat cover and it feels good to the touch. I installed the seat cover myself and noticed that there were only four clips to attach the cover to the seat. It would have been nice to have more than four clips. It was easy to install and has a velcro opening to help you get the back cover over the head rest. I am quite happy with the results of my labor and I am going to get another one for the other seat.